Not every person can swim; you, probably, will drown if you have never swum before. Newbie swimmers are often afraid to dive into the water, especially because the thought of drowning is often threatening. You may also see Certificate Samples. 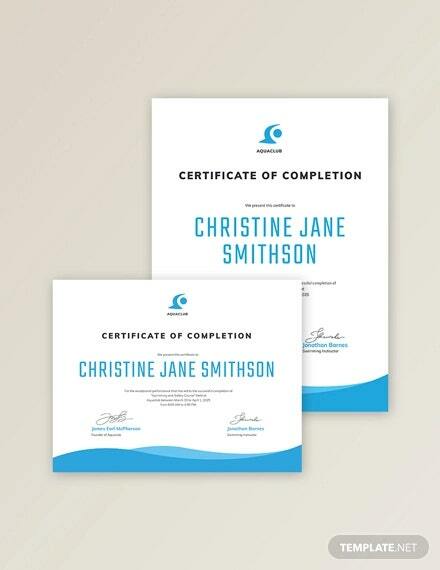 Swimming certificates, therefore, are for those who’ve taken the step to learn how to swim, despite the many challenges faced during the training. 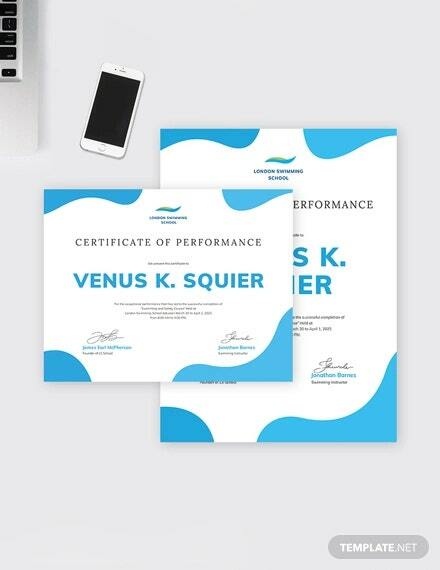 Of course, even those who have experience in swimming, too, can get the certificate, particularly after the swimming competition. You can also see Certificate Templates. 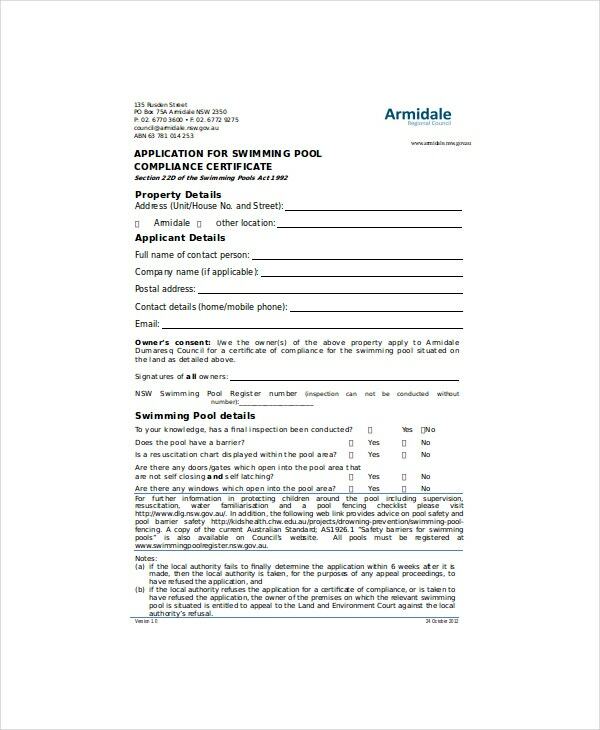 While it may appear unnecessary to have a swimming certificate, the document can be useful, in the sense that it signifies that the holder can make a suitable swimming instructor for those who want to learn to swim. There is no good reason not to have a swimming certificate. The award is a proof enough that you are not only safe in and around water but also you can make a good swimming instructor. While having a swimming certificate is not entirely necessary for all swimmers, it can act as a symbol of a person’s safety in and around water. 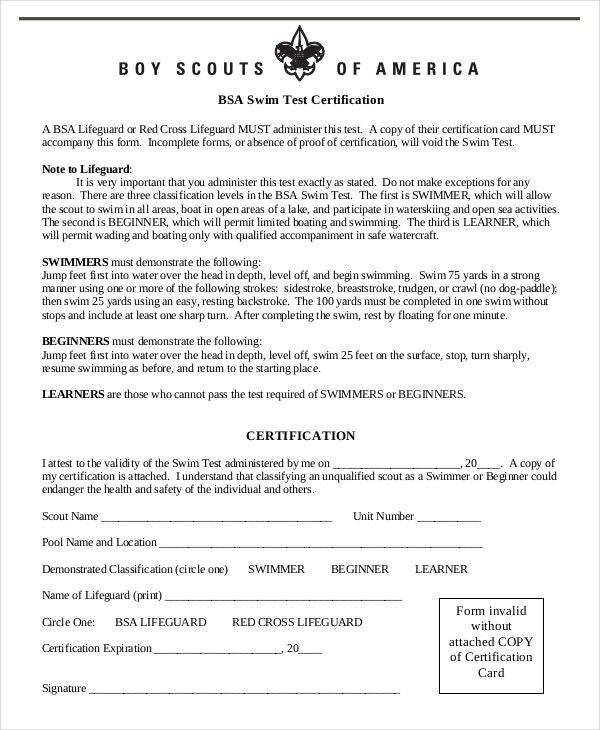 This customizable template is all you need to create the best swimming certificate. 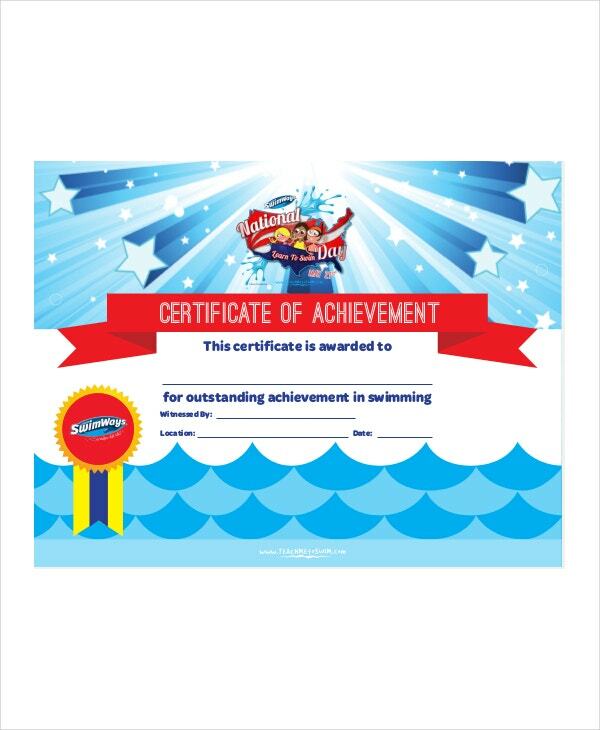 If you offer swimming classes, you know it is good to award the best students with swimming certificates. 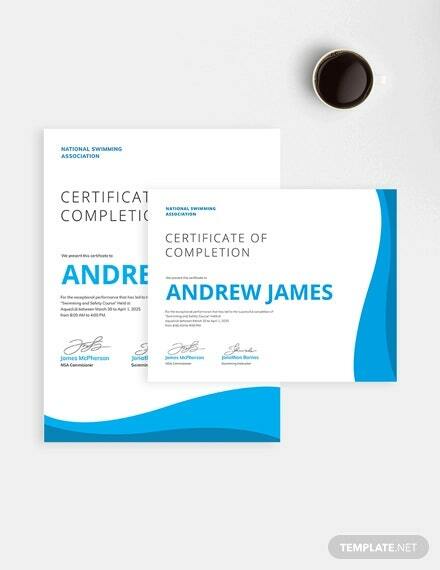 This template can help you create the best certificate for each student. Swimming instructors should give certificates to students who pass the swimming test. You can prepare the document of recognition using this template. It is easy to customize and free to use. > What are the Benefits of Swimming? Swimming is a great activity for fitness. Swimming is an activity that uses the major muscle groups of the body, making it one of the best aerobic activities for both the kids and the adults. It is the best activity that will get the heart of your child pumping the right way all the time. Moreover, the beauty of this exercise is that it not only improves balance and posture but also causes no injuries to the kids or adults. If you want your child to be healthy, you should consider swimming as the best activity for him/her. Swimming will not only promote heart and lung health of your child but will also lower the risks of childhood obesity. 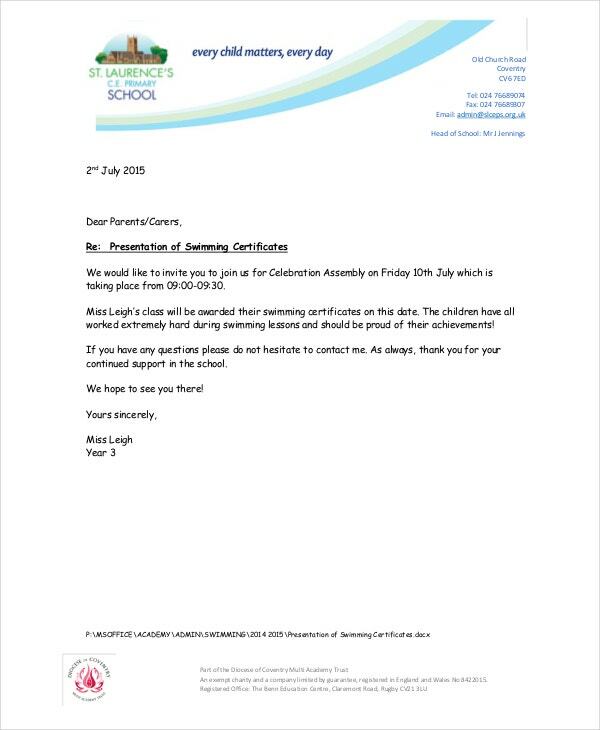 You can also see Reading Certificates. > How is Swimming going to Help an Individual be Safe? It is necessary to hire a swimming trainer if you have a swimming pool in your home. The reason for paying an experienced swimmer to teach you and the members of your family goes beyond the purpose of just having fun. Of course, people learn to swim because they want to have a good time with friends and families, but it is important to understand that the preliminary significance for learning how to swim and swimming should be to boost the health and enhance water safety. When every person in your home or friends’ list knows how to swim, you can be sure that they will always be safe in and around water. You can also see Work Certificate Templates. > How can one make a Child Love Swimming Lessons? Your child needs a trainer who has a caring heart. A male instructor, who has a heart for kids, makes a perfect choice although you can also hire friendly female swimmers. Children always want love and care, which means they can only take instructions positively within the margins of love and great attention. In other words, determine if your child is comfortable with a particular instructor before letting the trainer begin the lessons. You can also see Share Stock Certificate Template. If you know how to swim, you should consider training the child yourself. Train the child regularly. That way, they will develop the passion for swimming even when they are just on their own. Swimming is one of the most popular, competitive, thrilling, and fulfilling activities that many people engage in for fun. Overall, anyone can learn how to swim; all it requires is the passion for the task and the desire to learn to become a great swimmer. If you do not know how to swim, hire a swimming instructor, and they will help you get more out of the swimming lessons.